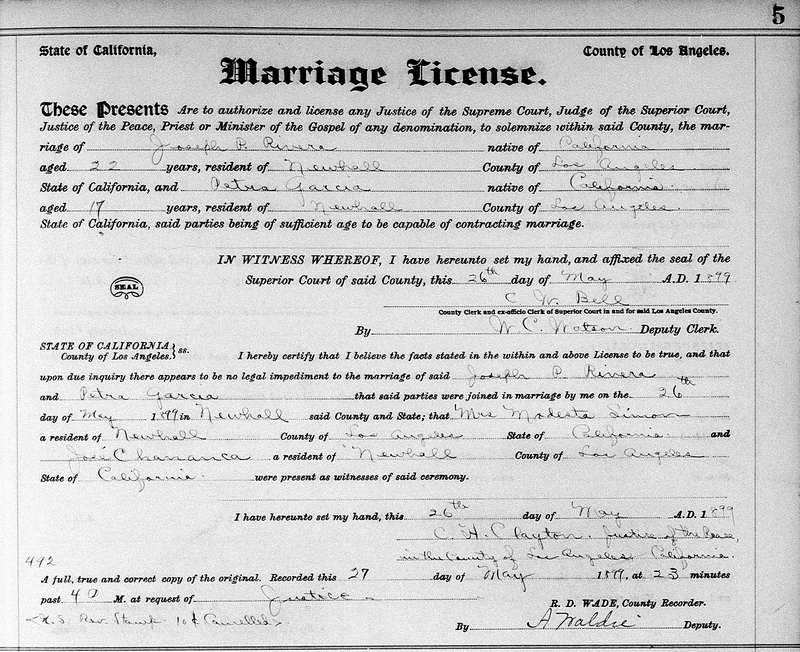 SCVHistory.com TLP9901abc | Tataviam Culture | Marriage License, Petra Garcia & Joseph P. Rivera, 1899. 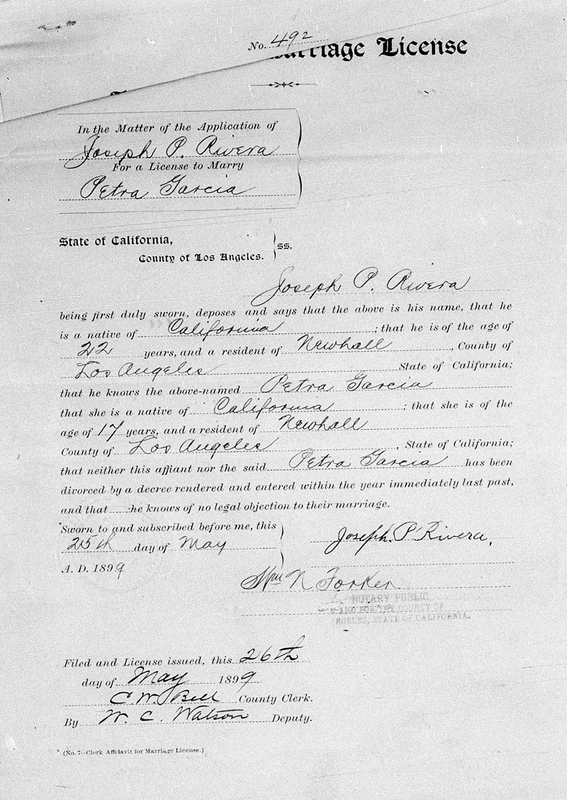 Affidavit for marriage license (below) and resulting marriage license (above) for Petra Garcia and Joseph Pedro "Pete" Rivera, wedding date May 26, 1899. Petra, 17, of Newhall (b. 1-31-1881), was a daughter of Chief Ysidoro Garcia and Josephine Leiva/Leyvas, and thus descended from individuals who lived at Chaguayabit village (Tsawayung), aka Castaic Junction, prior to European contact in 1769. Joseph/Pete, 22, of Newhall (b. 5-31-1877), is said to have been the son of Tejon Indians. That is a loose term assigned to any Indians who were brought to the San Sebastian (Tejon) Indian reservation in the 1850s-1860s (and some of their descendants) — e.g., Chumash (specifically ex-Mission Santa Barbara), Tataviam (ex-Mission San Fernando), Kitanemuk, Tongva (ex-Mission San Gabriel), Southern Paiute (removed from Owens Valley), etc. The couple was married by C.H. Clayton, Justice of the Peace, in Newhall. Witnesses were a Mrs. Modesta Simon and a José Chananca, both of Newhall. We presume "Chananca" is a misspelling of Chacanaca, a local family name. In the affidavit, Ysidoro (note how he spells his name) gives his concent for Petra, a minor, to marry. The age of consent in 1899 was 21. 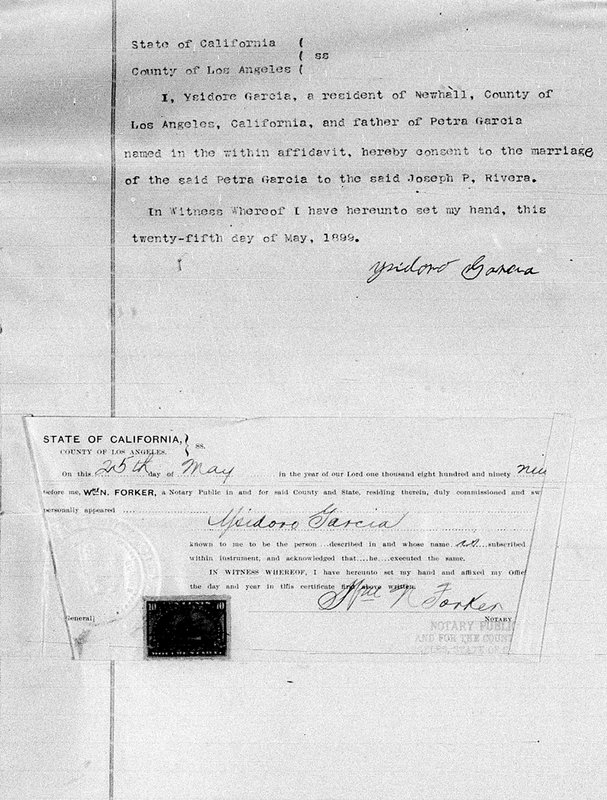 The affidavit is notarized by William N. Forker, an insurance agent and notary public who at one time maintained his office inside George Campton's dry goods store in Newhall. Four months after the wedding, on Sept. 12, 1899, Petra gave birth to a daughter, Margaret Sylvia Rivera, aka Margaret Sylvia Garcia, who in 1914 marred Eldridge Ward, thus estabishing the local Ward line of Native Americans. The marriage of Joseph/Pete and Petra didn't last. Both remarried. Joseph/Pete Rivera died in the St. Francis Dam Disaster, March 13, 1928. His body ended up at a morgue in Fillmore. He was buried at Oakwood Cemetery in Chatsworth (see grave marker). Less than two years later, on Jan. 24, 1930, Petra succumbed to liver cancer. Click to enlarge. Courtesy of Tricia Lemon Putnam. TLP9901abc: 19200 dpi jpegs from smaller jpegs courtesy of Tricia Lemon Punnam.